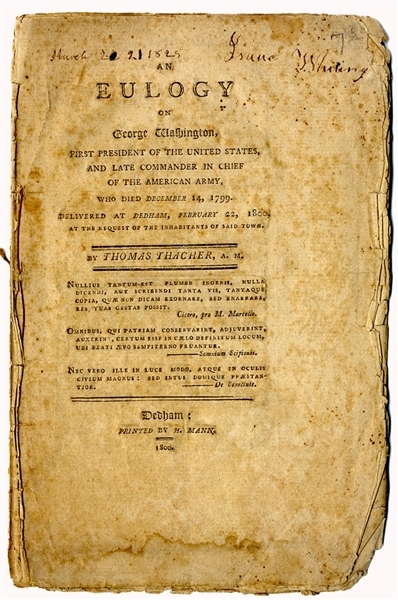 Imprint “AN EULOGY ON GEORGE WASHINGTON, FIRST PRESIDENT OF THE UNITED STATES, AND LATE COMMANDER IN CHIEF OF THE AMERICAN ARMY, WHO DIED DECEMBER 14, 1799.” Delivered in Dedham, Massachusetts, February 22, 1800, by THomas Thacher, 22pp. octavo, being Isaac Whiting of Dedham’s copy, in very small part: “..In this age of infidelity and licentiousness, he was ashamed to avow and honour the system of Christianity. He frequently attended its publick institutions, and in his last address has warmly recommended religion to the notice of his fellow-citizens. The last authenticated act of his life was worth of himself. In his last will and testament, besides having bestowed large sums for the encouragement of literature and publick utility, he hath liberated all the Africans who belonged to his estate...” Fine condition.